When the whistle blows, it’s time to go to work. Rise up, Phan Nation, it’s time to take care of some business. In order to provide a detailed perspective on where this team is, and what the upcoming games might mean in the context of this season, I dedicated a whole post to this on Monday. But suffice it to say, coming off a 5-game win streak and then dumping two in a row makes it feel like the team’s stated goal of 2016 playoff hockey is slipping through their fingers. They dug a hole, and are now trying to climb out. I’ll have more to say in the “looking ahead” section, below, about the importance of these upcoming games. Tonight’s game, against the foundering Binghamton Senators, is about as close to a “must-win” as you’ll see in February hockey. This Phantoms team needs to take care of business tonight. The Hamilton Street Heroes will need to climb to at least number 5–if not number 4–to be considered for the Calder Cup tournament. As you can see, some of the teams haven’t played as many games, and NO ONE has as many outright losses as we do. Upcoming games against Hartford and Bridgeport are of utmost importance, because those are the two teams directly ahead of us in the standings. “Taking care of business” against lesser opponents like Binghamton and Springfield, is also imperative. From a special teams and attendance standpoint, things are mostly status quo. With the recent roster fluctuations, special team units performance may not be predictive based on previous results. It continues to be important that the team stay out of the penalty box. On the Binghamton side, yesterday’s trade and player swap may impact their special teams units. More on Binghamton below. Nick Cousins and Anthony Stolarz , our All Star representatives, continue to represent us on the national stage; now both are in Philadelphia filling in admirably for ailing Flyers. Stolie hasn’t had his shot with the big club yet, and reports that Neuvirth is nearing health may yet thwart his opportunity. Tim Brent remains sidelined status-post hand/wrist surgery. We don’t expect him back for a few more weeks. Petr Straka, presumably out with an injured knee although we never received an official report, was seen skating “full-contact” on Monday and/or Tuesday. His availability for tonight’s game, however, is still very much in question. But, it’s good to hear, and hopefully we’ll get our leading goal-scorer back on the ice soon. Danick Martel had a hat trick in Bridgeport last Friday. No one there threw a hat for him, either. Cole Bardreau has played his way into the top-two lines. It’s not just the injuries and call-ups, it’s been his hardworking play, as well. Aaron Palushaj has returned from injury. He had the lone goal in the beat-down we took in Hershey on Saturday. Jason LaBarbera should be getting most of the work in net of late, as Stolarz backs up Mason in Philly. 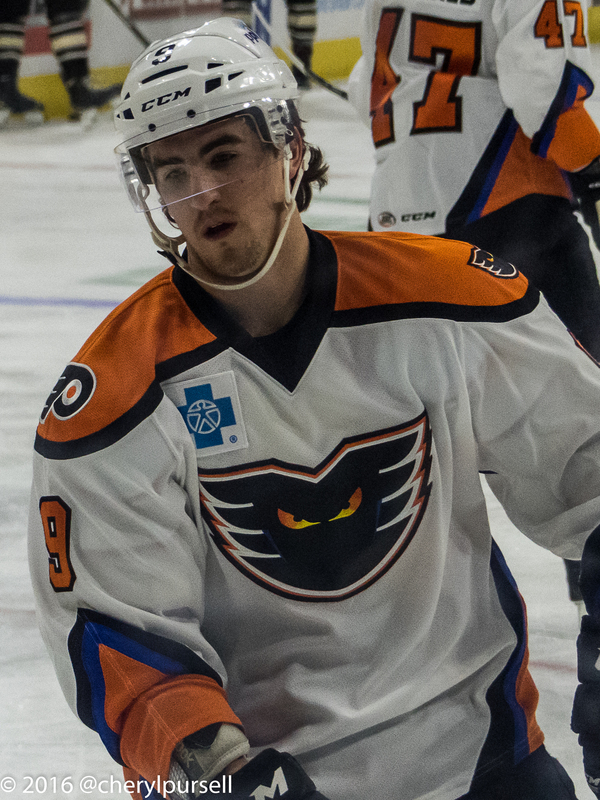 Martin Ouellette performed well in mop-up duty in Hershey on Saturday. It’s unclear if Stolie could possibly return in time for the weekend games. The Royals ended January by splitting a pair with the powerful Adirondack franchise. They dropped a mid-week contest before splitting two in Wheeling last weekend. They’re currently 22-18-4-3 and in third place in their division, not quite in playoff position. 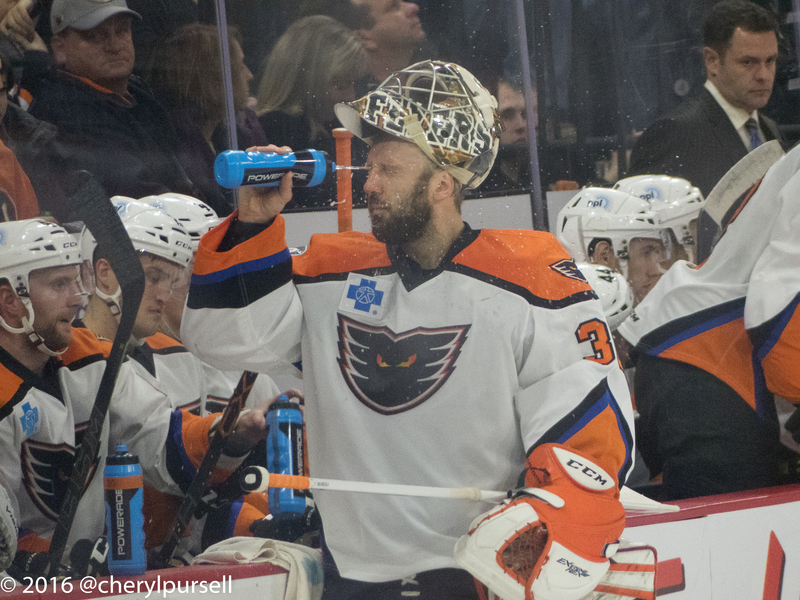 LaBarbera, still having trouble with the whole “water in the mouth” thing…. The Binghamton Senators are in town again–well, some of them. Some of the Toronto Marlies are here as well following a massive 9-player trade between the Senators and the Leafs yesterday. der Eishockeyzuschauer goes “Behind Enemy Lines” to scout the Senators. Tickets and Parking: Many good seats still remain for this contest. Most snow should be taken care of by now, and parking should be as per usual downtown. I’m still a big fan of the new “Community” deck on Sixth near Hamilton. Beginning this Wednesday through Easter each concession stand will offer non-meat options. Non-meat options in The Morning Call Club will vary on a game-by-game basis. The following items are prohibited during all PPL Center events to ensure the safety and comfort of our guests. Additional rules and regulations may be posted on PPL Center property or may be communicated through PPL Center staff. Guests are reminded to arrive early, as they may be subject to bag checks, a physical search and/or metal detection prior to entering the facility. – No wrapped gifts are permitted to enter the building at any time under any circumstances. *This list is subject to change without notice by PPL Center Management. Printable Rosters: See “Media Kit” .pdf above and print appropriate pages. Wednesday’s game will be preceded by a Career Fair in which representatives from area sports teams will be on hand, including the Philadelphia Flyers, Lehigh Valley IronPigs, Reading Royals, Somerset Patriots, Reading Fightin Phils and more. Admission to the Career Fair is complimentary with a ticket to Wednesday’s game. So I gather you’ll be able to visit those team tents after the gates open at 6PM. Pregame: TV goes live from Chickie’s at 6:30PM, while radio comes on a bit earlier so that you can listen on your way downtown–6:15 or so. I skipped pre-game meal last time out all in the name of diets and whatnot. Tonight perhaps I can be found at the bar in Chickie’s prior to the game. I have a couple of other pre-game places to test out, and I haven’t been back to the Hamilton in a while, but I think most will have to wait for the upcoming weekend games this month. Watch to see if the defense can protect LaBarbera. He’s been playing some good hockey lately, so it was surprising to see him give up as many goals as he did last weekend. I suspect he was left hung out to dry a fair few times. Watch to see how Robert Hagg plays, and who he’s paired with. He hasn’t stood out–at least not for the right reasons–of late. However, it’s important to remember that he’s only just turned 21 years old and is still developing as a player. But perhaps it’s the forwards not getting back to help out. With the injuries and call-ups it’s not surprising if the attack suffers, but I wonder what impact it could be having in our own end. Watch the effort. Coach said the effort wasn’t there Saturday–this is just about “do or die” time so I’d expect to see a fair amount of “jump” tonight. Fights. If there’s no jump, look for a couple players to try to get things going by throwing down. The Senators are not usually against participating in such activities, so it should happen pretty naturally. Straka. I doubt he plays–and if he does he could be worked in slowly. It’s something to watch for, though. Martel and Bardreau. These guys are starting to step up–and it’s good to see. Watch to see if they can keep it up their strong play. Palushaj. He’s a veteran, and he’s back playing. He was starting to come on a bit prior to his injury, and we need his contributions on the scoreboard right about now, as well. Saturday 2/13: Post-game photos with the players. Looking ahead at the hockey, this is a very important month for this year’s squad. We have five home games in a row, starting tonight, through next Saturday. They’ll travel to Springfield next Sunday, then there are two more home games the following weekend. That’s seven of the next eight games on home ice and 7 of 9 in the balance of February at the PPL Center. It’s not just gung-ho fans with goofy blogs who want playoffs–it’s a stated goal of the organization. From the ownership through the Flyers affiliation, and on down to the players and coaches, it’s something everyone is working towards. Of course, just because you set a goal does not automatically mean that you’ll be able to achieve it. It’s not over yet, of course, but I do believe that things could have worked out differently if Ghost had had some more time in Allentown to work his magic, and if injuries and call-ups hadn’t monkey’d things up. Not that I’m already looking towards next season, but what we’ve been discussing behind the scenes is that they need to plan for a bit more organizational depth–as well as putting together talented veterans and future Flyers for a playoff-caliber team. For now, all we can do is “rise up” and will this team to a bunch of wins. …if only it were that easy.